Using a side rail is an ideal way of providing protection for the bed occupant. Not only does it offer a physical barrier to prevent them from falling out of the bed and injuring themselves, it also gives them the peace of mind that the risk of such accidents has been reduced. Side rails, however, are not very comfortable, especially if the patient keeps leaning against them. The Invacare Line Side Rail Net Cover offers cushioning and protection for the user from one of their side rails, further reducing the risk of injuries. It also prevents the patient's limbs from becoming trapped in the rails, further enhancing safety. 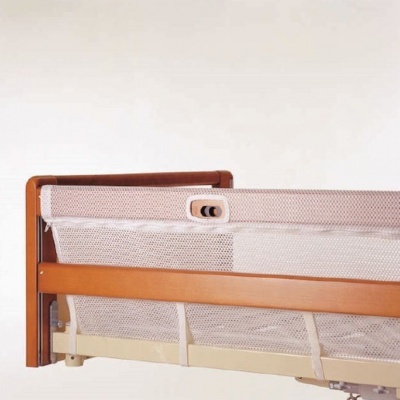 This Net Cover improves the safety of your side rail, reducing the risk of injury from bumps and preventing the patient's limbs from becoming trapped in the railing. This will help to provide enhanced peace of mind for carers and patients alike that injuries will be avoided. Please note: This product is supplied as a single cover for only one of your side rails. To cover side rails on both sides, two Side Rail Net Covers are required.